Holly Cottage ist die perfekte Kombination aus Alt und Neu und wurde mit modernem Komfort eklektisch restauriert. Wenn Sie nach einem anderen Ferienhaus suchen, dann ist Holly Cottage das Richtige für Sie! Holly Cottage ist der perfekte Zufluchtsort in Daylesford. Ein gemütliches und komfortables Bergmannshaus befindet sich nur wenige Minuten von allem, was Daylesford zu bieten hat. Das Holly Cottage liegt auf dem Wombat Hill und ist nur einen kurzen Spaziergang vom Cornish Hill und den Wombat Botanic Gardens entfernt. Die Hauptstraße mit ihren Cafés und Geschäften ist nur 10 Gehminuten entfernt (auf der Rückfahrt steil!). Vor dem Abriss und der Erneuerung gerettet, werden Sie feststellen, dass Holly Cottage noch kleinere Arbeiten durchführt und der Garten neu errichtet wird. Wir haben versucht, einen Teil des alten Charakters beizubehalten und die Geschichte des Hauses in das Design zu integrieren. Beachten Sie die Küchentapete, die mit den Zeitungen der 40er und 50er Jahre dekoriert wurde. Entspannen Sie sich auf der Außenterrasse, die aus Holz besteht, das bei der Restaurierung geborgen wurde. Setzen Sie sich am Küchentisch auf dem kleinen Hocker, der mit den Vintage-Vorhängen des Cottage neu bezogen wurde. Und achten Sie auf den Hackblock des Vorbesitzers! Einige der Wände sind schief, die vorderen Fenster sind original und das Dach rostet - was jedoch nur den Charme erhöht. Haustiere sind im Holly Cottage willkommen. Leider gab es eine Beschwerde über das Bellen, daher bitten wir Sie, dafür zu sorgen, dass Ihr Hund sich wohl fühlt und nicht während Ihres Aufenthalts in Ruhe gelassen wird. Bitte beachten Sie, dass das Cottage an allen Seiten eingezäunt ist. Sie sind jedoch selbst dafür verantwortlich, dass Ihr Haustier im Cottage sicher ist. Hunde sind im Haus erlaubt, aber bitte respektieren Sie andere Gäste und halten Sie Hunde von allen Möbeln fern. Bitte aufräumen nach Ihrem Hündchen. Speiseschalen sind vorhanden, aber Sie müssen Bettwäsche mitbringen. Bitte beachten Sie: Die Dusche ist über der Badewanne. Die Unterkunft ist möglicherweise nicht für Personen geeignet, die einen Rollstuhlzugang benötigen. Die Veranda hat keine Schiene. Diese Buchung gilt für das gesamte Haus. Bitte melden Sie sich, wenn Sie nur ein Schlafzimmer buchen möchten (die anderen 2 Schlafzimmer werden gesperrt). Holly Cottage met all our needs for a great weekend in Daylesford .Next time we book we will stay longer. 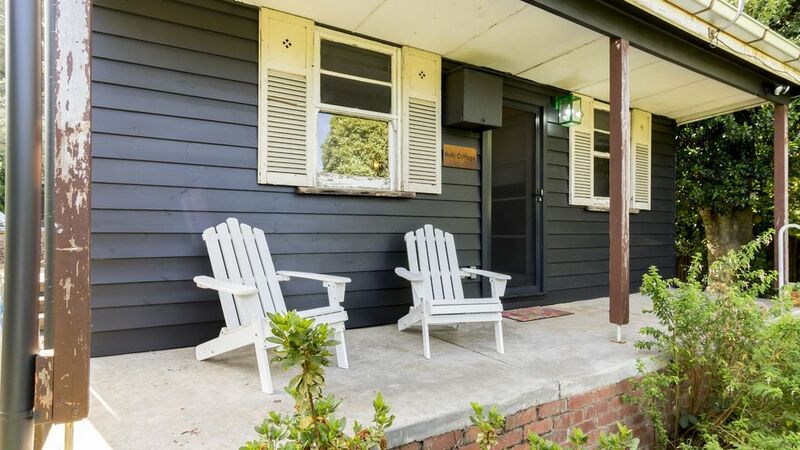 This gorgeous cottage is very close to the Daylesford action (and the main strip of shops) whilst still being tucked away and surrounded by beautiful gardens, leaving you feeling relaxed and secluded - when you want to be. The cottage is walking distance to both the lake and the shops and it is super cute and cosy if you just wanna stay in for the night. We had a fabulous girls weekend away and absolutely loved staying here. The place is very welcoming and comfortable and makes for the perfect getaway. The owner was lovely to communicate with and made some great recommendations for our stay. The cottage was filled with all your home creature comforts. Simply adorable! Thanks. We had a fantastic few days away and would definitely recommend staying here to others. A wonderful stay enhanced by Justine's generosity. We had a wonderful time at Holly Cottage accommodation. Justine ensured that we were very comfortable during our stay and her generosity was evident in many ways including "goodies" and warm house on arrival. The back garden looks terrific after recent work. The house is a relatively close walk to the lakes and great coffee. We hope to return to cottage again soon. Neat, clean, cute, cozy. It had everything we needed. Loved our stay at Holly Cottage. Was very relaxing, loved the quirky kitchen wall paper and the lounge was very inviting. What can I say? From the comfy beds, piping hot water and plenty of outdoor space to stretch out to in needed. 2 adults, 2 kids, 2 dogs, We will be back! Thanks Katie! I'm so pleased you all enjoyed your stay. I love the wallpaper as well - it is old newspaper I found under the floor coverings during the renovations. We'd love to see you all back in the future! A warm, welcoming, well appointed cottage with an interior design that delights the senses! A wonderfully enjoyable stay, in a delightful cottage which melds together the warmth and heritage of a period house with a fabulously entertaining and artistic interior design. Great location within walking distance to cafes, restaurants, bookshops, gardens and attractions. The property owner of this very comfortable and well appointed cottage was very helpful and welcoming. We'll be back! What a wonderful review Trevor. You've captured my intention beautifully! I'm so pleased you all had a great stay. I look forward to welcoming you back again soon. Loved this beautifully restored cottage! My friends and I have been going to Daylesford for a girls weekend away for years and years and it’s getting harder to find unique and quaint properties that really remind you that you’re away from home...until Holly Cottage! We absolutely loved this beautifully restored cottage which had all the charm you would expect, plus more. The owner clearly wished to retain the history of the building and has done so in an interesting, slightly quirky, but ultimately sensitive way - we all particularly loved the bathroom and kitchen. We also liked that the whole property was ours, that our privacy was respected and just how close we were to both the lake and the centre of town. We will definitely be booking Holly Cottage again for our next annual girls trip away. Das Holly Cottage liegt auf dem Wombat Hill und ist nur einen kurzen Spaziergang vom Cornish Hill und den Wombat Botanic Gardens entfernt. Die Hauptstraße mit ihren Cafés und Geschäften ist nur 10 Gehminuten entfernt (auf der Rückfahrt steil!). Wenn Sie sich aktiv fühlen, können Sie den Lake Daylesford, den Jubilee Lake und Hepburn Springs zu Fuß oder mit dem Auto erkunden - alternativ sind diese Ziele nur eine kurze Autofahrt entfernt.